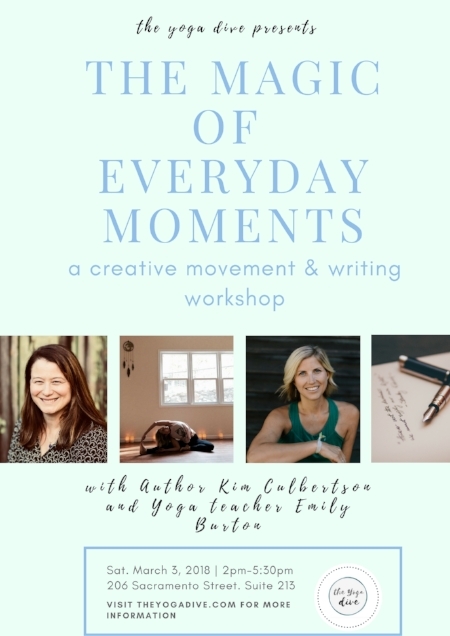 Join us with the amazing author Kim Culberstson and yoga teacher Emily Burton for an afternoon of creative movement and creative writing. Explore the beauty of the everyday moments of life and examine how these transform into creative production. This is a workshop for writers and for non-writers. If you feel like exploring the creative side of yourself, this is for you! Snacks, drinks, and inspiration provided. Kim Culbertson is the author of multiple YA novels, including Instructions for a Broken Heart (Sourcebooks 2011), which was named for a Booklist Top Ten Romance Title for Youth: 2011 and also won the 2012 Northern California Book Award for YA Fiction and The Possibility of Now (Scholastic 2016), which was named a Bank Street Best Children's Book of the Year (2017 edition). Much of her inspiration comes from her background teaching high school since 1997. In 2012 Kim wrote her eBook novella The Liberation of Max McTrue for her students, who, over the years, have taught her far more than she has taught them.